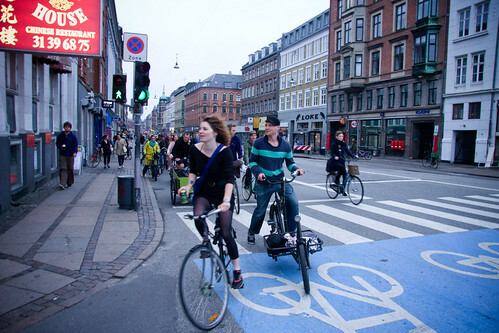 Last Wednesday, 50 of us went for an evening bike ride to celebrate the launch of our Copenhagen Cycle Tracks guide book to Copenhagen, which I wrote with three friends. 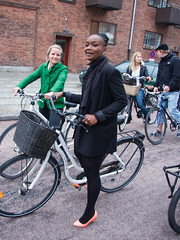 It was a great night out and fit perfectly with the concept of one of my other babies - The Slow Bicycle Movement. We went for a ride out to the Nordvest neighbourhood, stopping off at various locations we write about in the guide book, including a great Turkish bakery and an impromptu park on an empty lot. 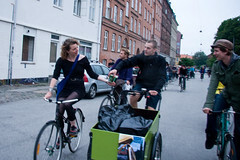 There was a poetry reading outside a bar and loads of rolling down cool urban streets and parks, enjoying beers from a cargo bike. 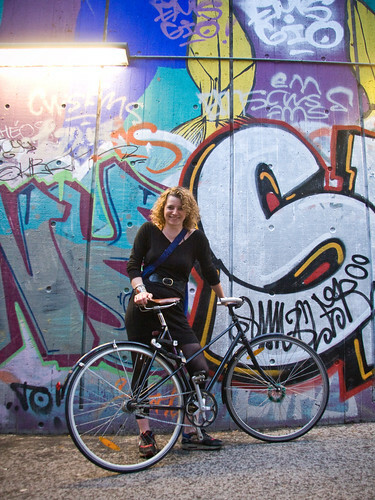 Here's Kristine, one of my co-authors, with her groovy-cool bicycle. Here's some other friends, including Emma, at far left, whom you may recognise from this previous post. A nice easy pace, perfect for conversing with friends. 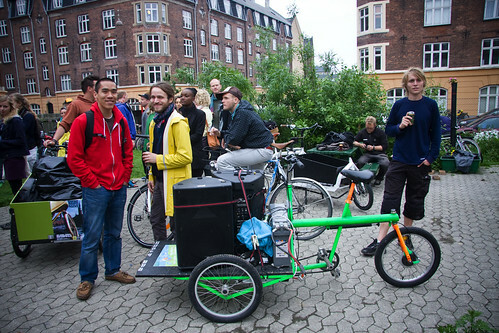 This is Kristine and one of the other co-authors, Simon, on his cool Longjohn cargo bike. 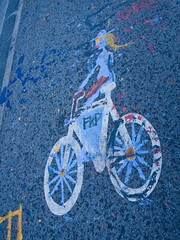 Some Cycle Chic street art and a chic cycling couple. The man carrying the beer is always a popular fellow. 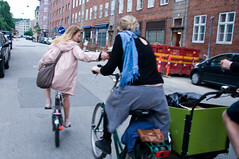 There are various ways to acquire beer whilst in motion. You can serve yourself [at left] or you can have it served for you [at right]. 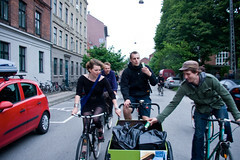 You can also get a beer from the cargo bike and then hand it off to your friend, before taking one yourself. It started to rain a bit so we ducked into a underpass for some more beers and some dancing. 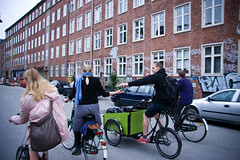 The music was, of course, mobile and propelled along the streets on this Sorte Jernhest cargo bike. 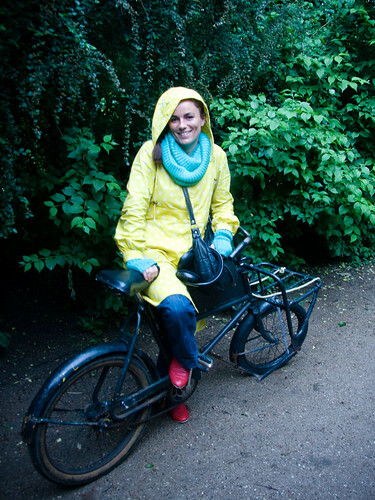 Riding a bike in heels is, of course, incredibly simple. Sometimes, however, it's best to take them off whilst dancing on a bridge in a park, before heading off into town to continue the festivities. There are some more photos in this Flickr set. Thanks to everyone for a great night out! Look a lot like a Critical Mass in Melbourne, including the beer, the music and the fun, relaxed ride. Hey! I live in Melbourne. 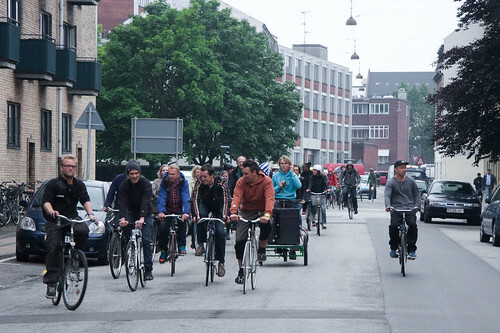 If Critical Mass is this cool - I'm in it! What Utopia is this !?? Beer AND bikes !??? How absolutely perfect! Wish we had those in America/Chicago! I take it there aren't bike helmet laws.......? ?